Pubs are a dime a dozen in Hackney, a historic working class quarter in London that has, in recent years, been experiencing a surge of gentrification marked by the arrival of young creatives, hipster studios and agencies, and under the radar boutiques. Martello Hall – named after the main road that once connected the St Augustine Tower, Hackney’s oldest building, to London Fields – is a natural heir to this uptick of fortune, with the millennial working generation firmly in its cross-hairs. 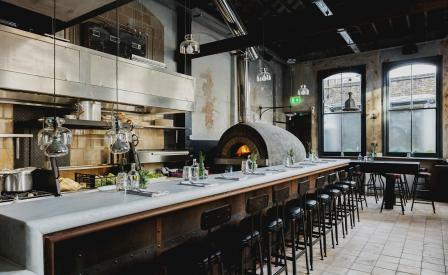 Housed in a mid-19th-century pile, it is the debut effort for the fledgling F&B group, Albion and East. Its MO is particularly interesting. By day, design studio Red Deer’s weathered interiors of furniture constructed of weathered timber, specially aged plaster, raw unvarnished ceilings, acid-treated copper bar tops and columns wrapped in braided rope are the stage for hot-desking, coffee and wood-fired pizzas. Come the night, and the space turns into a cocktail bar with young DJs spinning vinyl classics alongside live bands. Lubricating the festivities is an on-site gin distillery, whose small batches are paired with home-made syrups and limoncellos, and locally sourced beers. Meanwhile, the kitchen turns out zhooshed-up bar food like pizzas topped with Tuscany salami, mozzarella and hot honey, baby bomboloni served with Nutella, and torta fritta, small fried dumplings, that appear at the table amidst house-cured pickles, pardon peppers and rocket pesto.